Project+ is an all-in-one workforce management application integrated with Timesheet Mobile’s leading geofence based time tracking system and is included in all subscription plans except the Basics plan. Setting up projects instantly sets up multimedia, real-time, ongoing and archived communication threads accessible by all the workers included in the project. Checklists and PDF attachments help round out the capabilities of the solution. The features included with Project+ can help improve the management of company workflows and dynamic workforces. Adding projects can be completed in just a few clicks. Navigate to Project+ in the side menu, click on the Jobs tab, select the job you wish to add a project to and click "Add project". A new Project Card will be created showing the Project Name, Description and Team Members. On the Project Card, you can click the buttons to chat with team and add checklists. The project can be edited or archived when completed. Adding a new checklist to a project or adding items to the checklist can be done quickly. Team members will see new lists and items in their smartphone app immediately. Attach pdf files and specifications for projects. View checklists and see project progress. 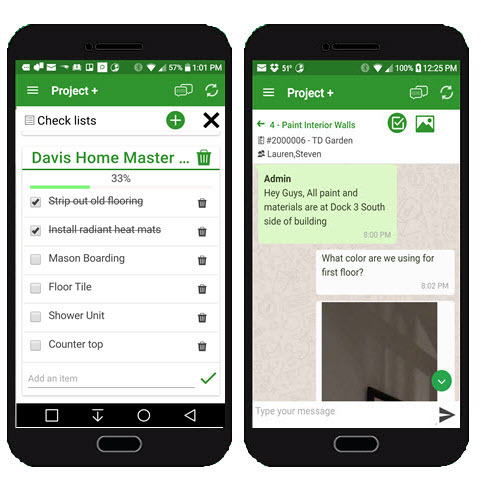 When you send a message, all team members listed will get instant notification on the Timesheet Mobile smartphone app or in their web browser if punching in from the web and will be able to reply, check off checklist items and send photos. Additionally, you can click to translate to English, Spanish, German, or French. Staff can check off items on the checklist, respond to instant messages and send photos. Changes and additions are visible to other team members and to managers and administrators on the web or their own smartphone app.